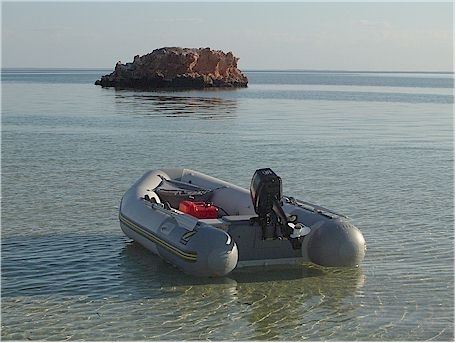 Fully formed boat ramps suitable for launching large boats are located in Denham, Monkey Mia and Nanga Bay Resort. Small boats can be launched off the beach at Gladstone and Bush Bay on the Wooramel Coast, Shelter Bay near Steep Point and some sites in Francois Peron National Park. Strong southerly winds are the norm in summer. Always check local conditions before heading out. Generally the waters throughout Shark Bay are shallow so keeled boats have difficulty navigating in many areas. Boat access is restricted in certain areas to protect sensitive habitats, breeding populations and other recreational activities. Reduce boat speed around dugongs, turtles and whales. Approach dugongs and turtles at slow speed and keep at least 50m away. Stay 100m from whales and do not go within 30 degrees either side of their direction of travel. Note the location of seagrass banks and stay away from shallow areas to minimize propeller damage. Seagrasses are the foundations of Shark Bay’s ecosystems and, once removed, can take decades to recover. Anchors cause severe damage to coral and seagrass and should not be used. Anchor only in bare sand. Shark Bay is rich in bird life, including migratory and breeding seabirds. It is also Australia’s most important nesting area for loggerhead turtles. Observe and conserve – do not disturb nesting turtles and seabird colonies.